"For the PM, electability apparently trumps criminal behaviour. Not a big seller in Conservative circles." (Michael Harris nails whats wrong with Stephen Harper in his November 24th iPolitics article. For Mr. Harper, no amount of lying, fabrication, Senate manipulation, RoboCalls etc matter if you can get re-elected. In Harper's world, Rob Ford is forgiven of everything if he remains 'electable'). "Rob Ford and Mike Duffy may not prove to be the end of Stephen Harper, but they are the beginning of the end. To what must be the disbelief of his political base, the prime minister reduced Mayor Ford’s saga — of cocaine use, driving while over-refreshed and hanging out with guys who pack heat and use it — to a political cliche. When asked for his view of the ‘gangsta’ side of Rob Ford, Harper responded simply that the voters of Toronto will decide his fate. 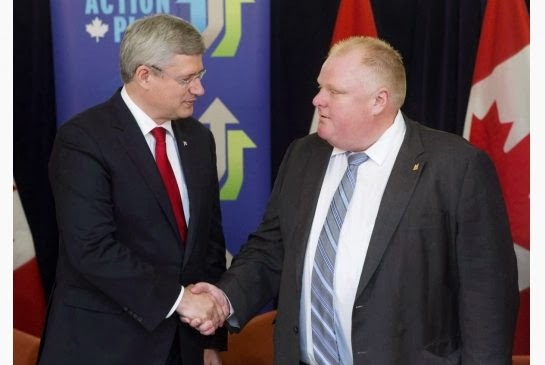 That can only mean one thing: If, 11 months from now, a conflagration of idiots re-elects Rob Ford, Harper is suggesting he believes that ROFO’s drug use and criminal associations are inconsequential, if not utterly without meaning. Political success purges all. This from the fellow who used to say he would rather lose an election than do the wrong thing in Afghanistan. It was also a strange thing to say for a man who has presented himself to his supporters as a champion of law and order. Harper once spoke for people who thought law-breakers should pay for their crimes, not run for public office. Jason Kenney, who properly called for Ford’s resignation last week, is now the sole Harper cabinet minister the base can trust on one of their key issues: justice. Conservatives have another peculiar trait. They traditionally expect their leaders and MPs to tell the truth — just ask ‘Lyin’ Brian.’ Wantonly misleading the public is supposed to be what Liberals do. Not only has Harper turned his mania for control on his own MPs, corseting the few who are actually allowed to speak in talking points — he has lied egregiously on Duffygate, and attempted to cover that fact with the aura of office."